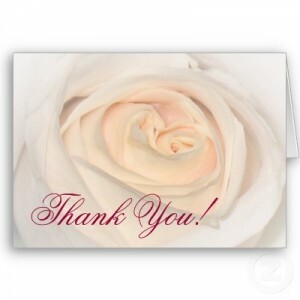 Right now thank you notes are necessarily old fashioned. They show that you care. If someone can take time out of their schedule to attend your event, and spend their own money to give you a gift, then it’s important and necessary to show them that you appreciate it. The way that we show this gratitude is to write out a handwritten note of about a paragraph in length, stuff this note into an envelope, address it to the recipient, slap a stamp on it, and send it through the mail. This could easily be accomplished in far less time, for far less money, and for far less impact on the environment through a digital medium (like email). However, this just wouldn’t carry the same sentimentality, or indicate as much gratitude quite yet. Society isn’t ready to accept that someone really appreciated the gift and time that were given if the note isn’t handwritten. I’d like to think that this transition is inevitable at some point however. Many people have always fought the digital migration of things like newspapers, books, invitations, and it’s only a matter of time before the thank you notes migrate as well. Maybe there’s something we can do to speed up the migration. Here’s an idea. Create a service that makes a digital thank you note more meaningful, sentimental, and valuable than a paper thank you note could ever be. Instead of handwriting a paragraph long note,record a 30 second video personally thanking the person for their individual gift. Maybe attach a photo of yourself using or enjoying the gift. Most people wouldn’t be savvy enough to sit down at their computer to record, edit, compile and attach a video/photo/note, but I think a streamlined online service could be very valuable at automating all of this. Imagine you have a grid where you enter each person’s name, email, and a brief note. When you’re ready, you press go, and the site steps you through recording your 30 second thank you video using your web cam. After you’re happy you submit your notes, and the service files off a beautiful pingg style email to the recipients complete with your note and a link to your personal video. It’d be interesting to see whether the general public would appreciate this more or less than a handwritten thank you, but I know personally I’d be a lot more entertained by a nice short video than I would by receiving another piece of mail. Posted on April 2, 2010 by petkanics. This entry was tagged Ideas. Bookmark the permalink. Dude that is a wicked card that is one of the best cards ive every seen. U picked the best backround and lettering. I love it.